Tap/click here to get the latest codec files. PC USERS: To use network MIDI with rsTouch, you must have a CoreMIDI compatible network MIDI driver. See the rsTouch user manual on the rsTouch product page for more information. 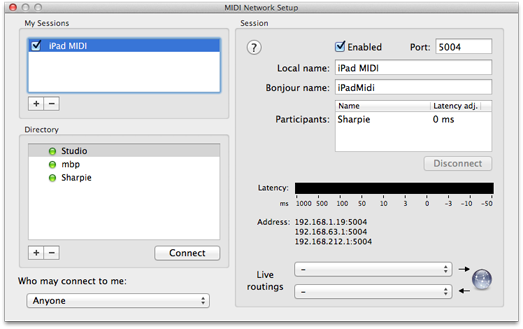 OR a “network MIDI” set up using the iPad’s Wi-Fi. 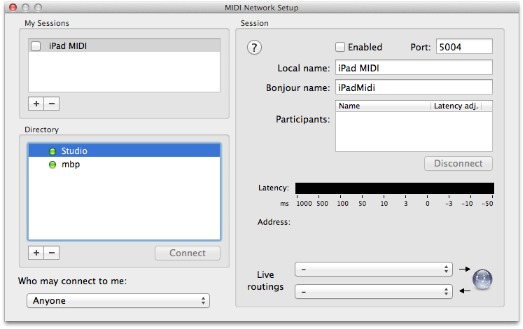 Network MIDI requires that your Mac or Windows PC is connected to the same local area network as your iPad. 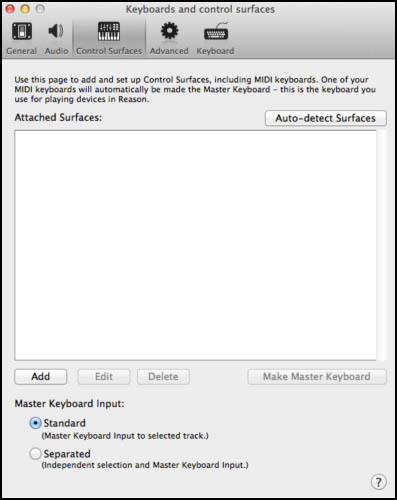 It also requires you set up the network MIDI interface on your computer, and in the case of a Windows PC, you must also install a special MIDI driver (see More Info: rtpMIDI at the end of this page). Regardless of whether you use a Mac or a Windows PC, it’s important that you always establish your network MIDI connection from rsTouch’s connect screen and not from your computer. rsTouch will refuse the connection if you attempt to make it from your computer. Tap on the icon below. The support files are bundled in an easy to use installer that handles all the details of putting these files in their proper place. Download the corresponding installer if you have not already done so, then run the installer on your computer. Use your computer to perform the download, not the iPad. You will only use the installer on your computer and it is tricky to download a file to the iPad and then move it to your computer. 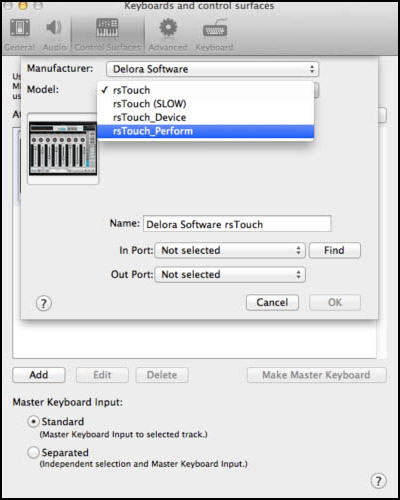 You must configure Reason to use rsTouch as three different control surfaces (one for each of rsTouch’s major operating sections- Mixer, Device and Perform). This is a one-time setup, and must be performed before you try to connect rsTouch with Reason the first time. You must add three new controllers to Reason, one for each of rsTouch’s major sections. This also must be done manually as Reason’s “Auto-detect Surfaces” button will not work for rsTouch set up. Select Delora Software as the manufacturer. You will see 4 choices for “Model”: rsTouch, rsTouch (SLOW), rsTouch_Device, and rsTouch_Perform. Type in/assign an easy to remember “Name”. 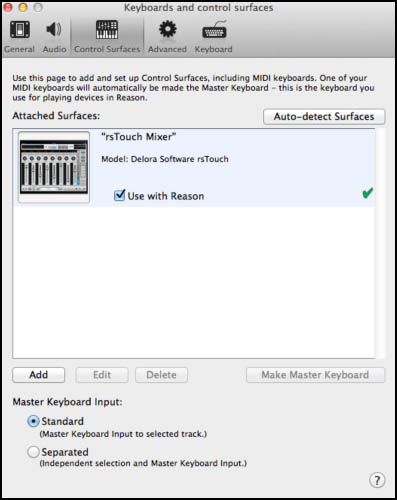 This example uses “rsTouch Mixer” so it’s easy to see that this is rsTouch’s “Master and Mixer” controller. Assign the MIDI input and output you are using to connect your iPad and computer. Usually the in port and out port are the same MIDI device. Here a network MIDI connection is used. Press OK and you should see something like the screen to the right. You have now successfully set up the first of rsTouch’s three controllers. The next two are done similarly. Here’s how you set up rsTouch’s second controller, the “Device” section. Note that you must use the same MIDI ports as you used for the first controller. Once you have added all three rsTouch controllers your final Reason set up will look something like this screen. The yellow “caution” graphics are normal. If, however you see a red “X” graphic then something is wrong with your MIDI connection. 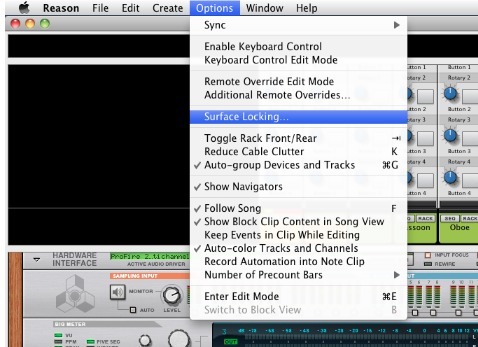 Reason offers a simple way for you to manually "lock" rsTouch to the Main Mixer. 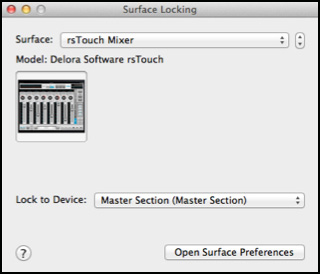 Once locked, rsTouch continues to control the Main Mixer, regardless of the selected track or rack device. Locking rsTouch to the Main Mixer is required for each new or unsaved song! If you don’t, rsTouch alerts you by flashing its “i button”. 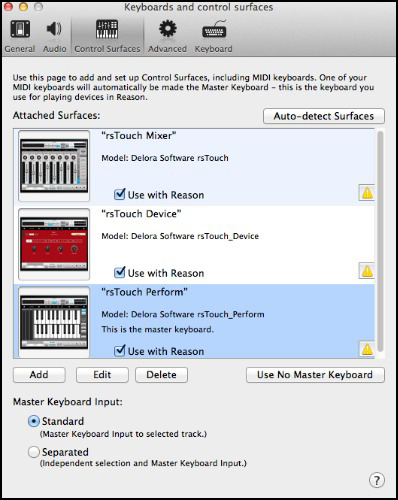 This shows a “Surface Locking” dialog window with a drop down menu to select the controller you want to lock (rsTouch-MIDI in this case). 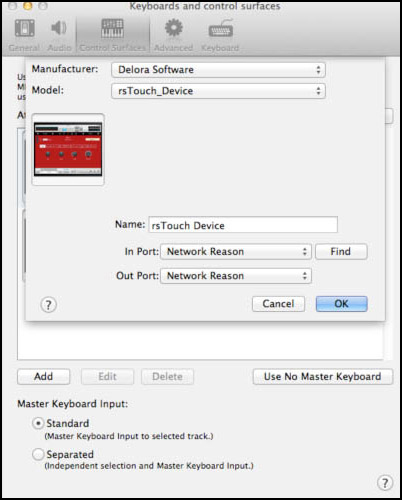 Select rsTouch, then click on the “Lock to Device” drop down menu. This is a list of the project’s current Reason devices. Launch rsTouch on your iPad. You will first see the “Master” view. Tap the “iButton” ￼(shown circled in the screen shot) to initiate a connection. The “Info Screen” will appear. Tap on the Connect text/bar to display the main connection screen, “MIDI Connections”. 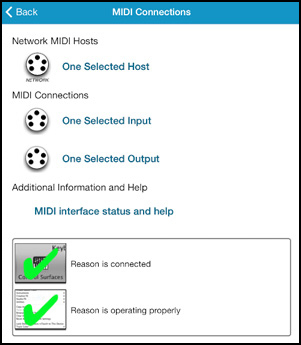 The top item shows if rsTouch is connected to any network MIDI “hosts”. The red “X” through the MIDI symbol indicates that there is either no selected host, or that the one selected is not currently available. Below it are the input and output “MIDI Connections”. Your iPad may have multiple MIDI interfaces attached, internal MIDI connections, and an active network MIDI connection. Each provide possible inputs or outputs. Select which to use by tapping on the input or output item as needed. Make sure that the iPad’s MIDI interface is connected, and if needed, powered. Tap on the “USB MIDI Interface” (or whatever name your iPad MIDI interface uses); rsTouch automatically takes you back to the MIDI Connections screen. Make sure the iPad’s Wi-Fi is connected to the same local network as your computer. Tap the desired host; rsTouch automatically takes you back to the MIDI Connections screen. 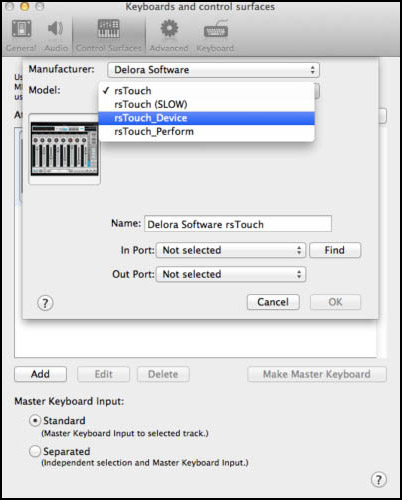 Tap on the “Network Session 1”; rsTouch automatically takes you back to the MIDI Connections screen. rsTouch attempts to establish full communications with Reason once you have selected your MIDI connections. The MIDI Connections screen adds additional information that shows whether rsTouch is successful and if not, which step encountered a problem. Tap on the info button. Tap the ‘Settings’ text/bar and a Settings screen appears. Most of the steps above only need to be done the first time you setup rsTouch. Exception: As noted in action 4 above , you must always have the current song "locked" to rsTouch. If you save a song after doing this, you will not have to perform this step again with this song. Or if you perform this lock sequence on a template that you use to create songs, and save the template, then any new song created from that template will already be "locked". Otherwise this step must be done for each song opened. Sometimes the connection between rsTouch and Reason may become disrupted. In this case, the iButton (info button) will be pulsing red to indicate that you must take steps to (re)connect rsTouch. (If you have performed the original connection steps, wait a few seconds when you startup rsTouch in the future to give it time to automatically re-establish a connection). If the i button continues to pulse, tap on it - the Connect text/bar will show yellow (warning) or red (not connected). Perform the same connections steps you did in #5 above depending on whether you are using network or wired MIDI. If the info button still blinks red, see the Troubleshooting sections of the user manual. rsTouch works with Reason Essentials, but conforms to the Essentials Mixer feature set. For example, Essentials does not have Dynamics controls, so neither does rsTouch when used with Essentials. Sometimes this means buttons are grayed out. rsTouch automatically recognizes your application and displays the appropriate screens. If you wish to send and receive MIDI over the Wi-Fi network between your iPad and a Mac then you need to set up that computer to offer a network MIDI connection. 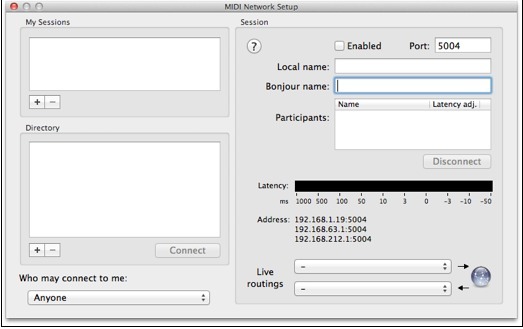 Any Mac running OS X Leopard or later already has network MIDI built in. Start by running Audio Midi Setup. Double-click the “Network” icon. This will bring up the network MIDI setup screen. If you have never set up a network MIDI connection before you will be greeted with a screen like the one here. Network MIDI connections are “sessions”, and you provide a name for each one. You can define as many sessions as you wish, each with its own settings. rsTouch requires a single session. Click the “+” button under “My Sessions” to create a new network MIDI connection. Provide a local name of your choosing (something easy to figure out and that does not conflict with other MIDI ports), and a “Bonjour name”. This is what you will see in rsTouch’s connection screen. Next, select the session by name, then verify that the popup under “Who may connect to me:” is set to “Anyone”. Tick the check box next to the session you wish to use. This will enable the session to accept connections. rtpMIDI’s set up application is similar to OSX’s Audio MIDI Setup so you may find it helpful to look over the previous section. Also remember that you cannot establish the connection with your iPad from the rtpMIDI set up application. 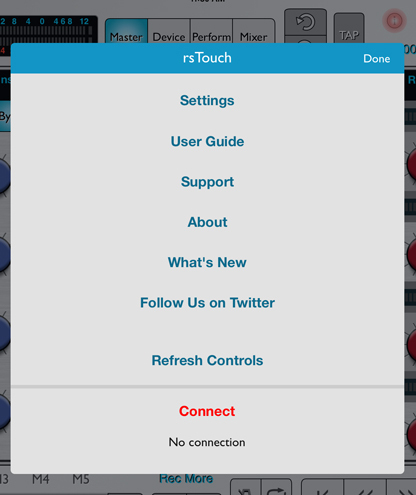 Always use rsTouch’s connection screen to initiate the connection. Whether you use rtpMIDI or elect to use the iPad’s USB MIDI is entirely up to you. Harmony Systems, Inc. does not endorse or otherwise encourage you to use rtpMIDI, nor does it guarantee that rsTouch will work properly with rtpMIDI. Furthermore your use of rtpMIDI is governed by the licensing and requirements of Tobias Erichsen; you should understand what requirements, including any licensing payments, he requires. 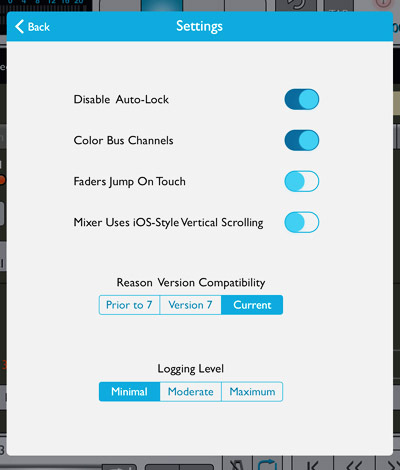 rsTouch, beginning with version 2.2.0, can be used on multiple iPads to simultaneously control more than 8 Reason Main Mixer (the “SSL”) channels. For example, with two iPads, the first iPad could control the first 8 mixer channels, while the second iPad controls the next 8 channels. This provides a “window” of sixteen available mixer channels that can be moved about using the rsTouch bank controls (move by one or 8 channels), or directly setting Reason’s Remote base channel. Up to four iPads can be used simultaneously to control 32 mixer channels. This is the same requirement as a single iPad installation except the “rsTouch” controller now has a total of four variations, and one of those variations must be installed for each iPad. Each set of controllers (for each iPad) must use a dedicated MIDI port to connect to Reason. 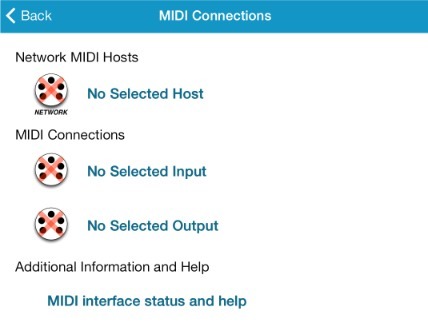 If using network MIDI, each iPad must have its own dedicated network MIDI session. If using regular “wired” MIDI, each iPad must have its own MIDI interface, and those interfaces must be connected to a corresponding MIDI interface on your computer. You can mix network MIDI and wired MIDI in the same set up. So, for example, iPad #1 could use network MIDI and iPad #2 wired MIDI. 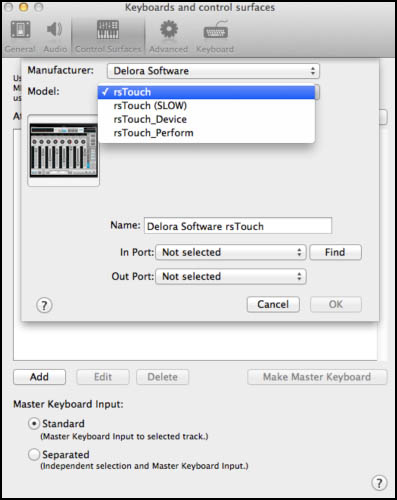 Multiple network MIDI sessions can be readily established using Audio MIDI Setup on OSX, or rtpMIDI on Windows. Any number of network MIDI sessions can be active at the same time for OSX. Some versions of WIndows, however, limit the total number of available MIDI ports so make sure that your configuration does not require more ports than Windows supports. In all cases make sure that your network MIDI sessions are configured and enabled before starting Reason, otherwise Reason may fail to recognize the ports when they are enabled. This does not mean you need to have your iPads connected before starting Reason, only that the network MIDI sessions are enabled. One time set up of multiple iPad control surfaces follows the same procedure as setting up a single iPad. Each iPad has a “group” of three control surfaces as noted above. Each group of surfaces shares the same MIDI port. The difference when setting up multiple iPads is that the “rsTouch” control surface is replaced by one of the “rsTouch_Mixer” variants; “rsTouch (9-16) for the second iPad, “rsTouch (17-24)” for the third, and “rsTouch (25-32) for the fourth. rsTouch works nearly identically when used in a multiple iPad set up. You can access the Perform screen from any of the iPads at the same time. So, for example, you could have the piano keyboard set to different octaves on different devices, or have the drum pads showing on one iPad and the piano keyboard on another. Each iPad’s Device screen controls the active Reason rack device, or if you use surface locking, a different rack device. If all the iPads control the same rack device, you can view more than one device screen at a time. For example, when controlling Thor, one iPad could control the filter screen while another controls the step sequencer screen. Locking one or more iPads to a particular device can be very handy if you wish to do something like control an RPG-8 and the Thor is playing at the same time. Another useful approach is to lock an iPad to a send or insert effect. 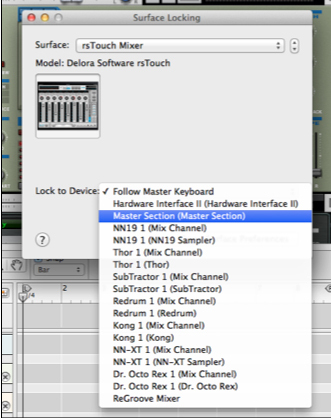 Each iPad’s Master screen controls the Reason Main Mixer master section. Likewise the transport controls, Big Meter, master volume, etc. are shared by all iPads. However, the five transport marker buttons, M1-M5, are unique to each iPad, so you could set up more than 5 markers. The main difference when using multiple iPads is how the rsTouch Mixer panel operates. Banks still move either by-eight or by-one. Each iPad though shows a different set of eight mixer channels. The first (primary) iPad shows the first eight channels in a bank. 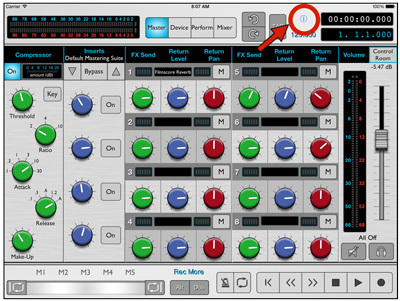 Additional iPads show the channels according to which control surface device was assigned; rsTouch_Mixer (9-16) controls the second set of eight channels and so on. The bank controls +8, -8, +1, -1 on each iPad perform the same action. So, if you tap +1 on iPad #1, it shows channels 2 - 9, and the other iPads will also increase their channels by 1 (iPad #2 would show 10 - 17, iPad #3 shows 18-25, etc. The four bank recall buttons still move the “base channel” in the same fashion as when only a single iPad is used. So if you press a button whose base is channel 9 (like the default setting for the second button from the top) then all of the iPads adjust their mixer channels accordingly, with the primary iPad showing channels 9-16. The four bank recall buttons, however, can be set up uniquely for each iPad if you wish to have single button access to more than 4 different sections of Reason’s Main Mixer.